Following his brother half way across the galaxy seemed like a good idea at the time, but it hadn’t hit him just how much he was giving up. Stir-crazy after three weeks in space, Kerit, professional surfer turned interstellar colonist, jumps at the chance to get off the ship and onto the new planet’s surface—even if it is a little inhospitable. He expects searing heat. He expects acid rain. He even expects the sunburn from hell. What he doesn’t expect is to meet Folly—the most prickly, irritating, and fascinating girl he’s ever known. And he needs her help if they want to make this planet their new home. But something sinister lurks in the ruined city, and neither of them realise how much they are going to have to rely on each other if they want to make it out alive. 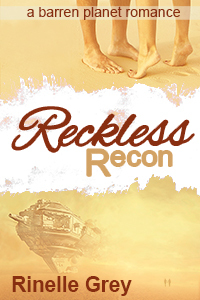 Reckless Recon is the third book in the Barren Planet Romance series. Each book can be read alone, but is best enjoyed as part of the series. Congratulations. Looking forward to reading it. Thanks Rosie. Hope you enjoy it.